Luton Diving Club Junior's Hoodie Hooded Top with Side Panels and Piping. 65% Polyester ..
Luton Diving Club Junior's ¼ Zip Sweat Top 1/4 Zip Top with contrast side panels with piping o..
Luton Diving Club Senior's Hoodie Hooded Top with Side Panels and Piping. 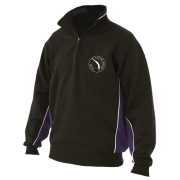 65% Polyester ..
Luton Diving Club Senior's ¼ Zip Sweat Top 1/4 Zip Top with contrast side panels with piping o..